Reawaken your Soul. Feel Alive!! From a huge selection choose either rough or hand polished crystals. 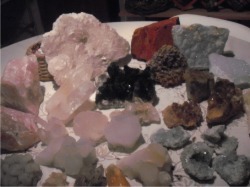 Attracting love, connecting with your spiritual guides, uplift your spirits or protection are just some of the properties crystals can offer you. Used and New Books on healing, crystals and self-help, plus a few used tarot decks or a new deck of angel cards. These make ideal gifts for yourself or a loved one. Imported silk sari to drape or cut up for an outfit is ideal. These silk saris go for as low as R100 each and are at least 6meters long. Each Angel Oil is uniquely channeled and filled with aromatherapy oils that the Archangel required. The true essence of Archangels. Use these Angel Oils in your home, work and car, or anywhere you want to invite the Archangels too. Start with the Archangel that is working with you now. Oils cost : R80- per bottle. Kindly note that this is a house shop, to avoid disappointment please phone before visiting. Have just received a consignment of large crystals. Most are over 1kg in weight and fairly large. Please view the crystals, and then contact me as to which you are interested in, I will then forward you more details: Size, weight, price, postage and packaging etc.